Sundaram being built from the ground up. Sundaram finished and open for business. A few years back, the owners visited San Francisco, also known as San Pancho, in the estate of Nayarit, in the famous Riviera Nayarit. They fell in love with the town and its spectacular setting on the coast. It is quaint, quiet and beautiful, not crowded and where relaxation is the norm. It is not a hustle-bustle town, which has kept its charming old Mexican flair. So they started to look for a lot where to build their dream house, close to the ocean, amongst sand and jungle. They found a wonderful spot, a block from the beach towards the jungle, a bit away from town, in the secluded, quiet, safe and serene Costa Azul neighborhood, across the street from the Beach Club of La Patrona Polo and Equestrian Club. *Please note that our pool is heated year-round and has a state of the art Ozone and Purification Process. They interviewed a few architects, searching for the one that would resonate with them. They wanted to create a Zen-contemporary home. A talented Mexican architect from Guadalajara was awarded this very involved task. Owners Abraham and Felipe stayed involved from inception to completion. This Eco Chic house is a mixture of, their design, management and hospitality experience. 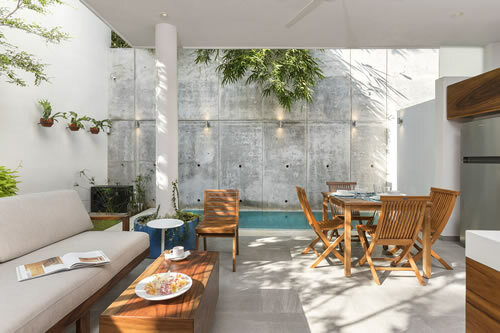 They incorporated 2 high-end suites in the east side of the house, for people who want Eco luxury, a quiet and peaceful environment, where yoga, lazy walks at the beach, sun and food will encompass a wonderful relaxing vacation. They created a wonderful environment for themselves and their guests side by side. They have minimum garbage and waste and the served waters go back deeply into the soil so there is no waste waters going to the ocean. The house has solar panels to produce its own electricity. San Pancho offers quite an ample program of recycling. 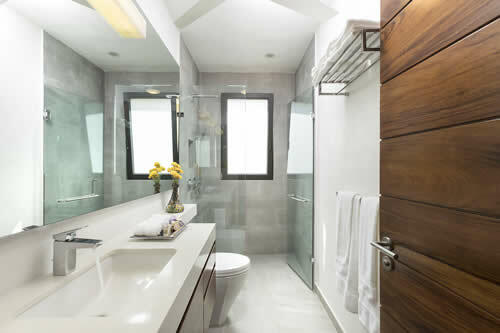 All plumbing has state of the art Japanese water saving technology and the air conditioning units have power saving systems.